Chandigarh: In a first decision of its kind, a court in Shaheed Bhagat Singh Nagar (Nawanshahr) has convicted three Sikh activists under section 121 (Waging War Against the State) and 121A (Preparing to Wage War Against the State) of Indian Penal Code (IPC). Surprisingly the charge u/s 121 and 121A were rejected even in Punjab CM Beant Singh execution case but the court of Additional Sessions Judge (SBS Nagar) Randhir Sharma convicted three persons on the basis of “recovery” of a printed biography of Shaheed Sukhdev Singh Babbar, photographs of 13 Sikhs martyred by Nirankaris in 1978 and a Samsung mobile phone. According to the police story on 24 May 2016 SI-Gurdial Singh along with other police officials was present at T-point, Jadla Road, Rahon in connection with patrolling duty and checking of suspected persons, where DSP Mukhtiar Rai, PPS along with his gunmen and other police officials came and joined the police party. Thereafter, check post was arranged and at about 10:18 pm, he received “secret information” to the effect that Arwinder Singh son of Gurnam Singh, resident of Village Pallian Khurd is alleged active member of ‘Babbar Khalsa’ and has returned to India from Doha Qatar about 7-8 months ago. As per police story Arwinder Singh was allegedly enticing Sikh youth for recruitment in the Babbar Khalsa and has been planning to “wage war against India”. Police said that finding this information credible and trustworthy, ruqa was scribed and was sent to the police station. On the basis of which, FIR was registered and the investigation of this case was taken over by DSP Mukhtiar Rai. Police said that it arrested Arwinder Singh from bus stand, Rahon on 25 May 2016. One mobile phone make Samsung was recovered from him. In this case the prosecution witnesses were all police personnel. The judge noted in his judgement that “prosecution has examined HC-Prem Kumar as PW-1, HC-Daljit Singh as PW-2, HC- Jarnail Singh as PW-3, Sudhir Kumar as PW-4, Sukhwinder Singh as PW- 5, Dalbir Singh Virk as PW-6, Gagandeep Singh as PW-7, Amarjyoti as PW-8, Kulwinder Singh as PW-9, HC-Charanjit Singh as PW-10, HC- Bagga Singh as PW-11, Sunil Kumar as PW-12, HC-Ram Pal as PW-13, ASI-Sodhi Singh as PW-14, Mandeep Singh as PW-15, SP Jain, Nodal Officer as PW-16, Harvinder Singh, Nodal Officer as PW-17, SI-Gurdial Singh, Investigating Officer as PW-18, Inspector Ved Parkash as PW-19, Mohinder Pal as PW-20 and DSP-Mukhtiar Rai as PW-21”. “No other evidence was led by the prosecution and thereafter, learned Additional Public Prosecutor for the State closed evidence of the prosecution”, the judge noted further. The arrested persons denied the allegations levelled by the police and the prosecution. The defense examined four witnesses namely Bhajan Singh as DW-1, Nirmal Singh as DW-2, Mahal Singh Dhillon as DW-3 and Sukhdev Singh as DW-4. Police recoveries in this case are listed as: “97 books, 198 photographs and 13 photographs of Sikhs, who had died in the Saka of 1978 and 1000 books in connection with biography of Sukhdev Singh Babbar were recovered from him”. The police alleged that “Surjit Singh contacted Ranjit Singh for Sikh struggle and they had pasted posters of the formation of Khalistan on the occasion of Hola Mohalla at Anandpur Sahib”. The police plea for convicting the arrested persons for waging war against the state included the allegation that they had “got prepared prints of (photographs of) 13 Singhs got martyrdom in 1978 saka” and “prepared 200 copies of that photograph”. Police evidence included two flaxes and 10 books of “Operation Blue Star” that were allegedly recovered from Ranjit Singh. 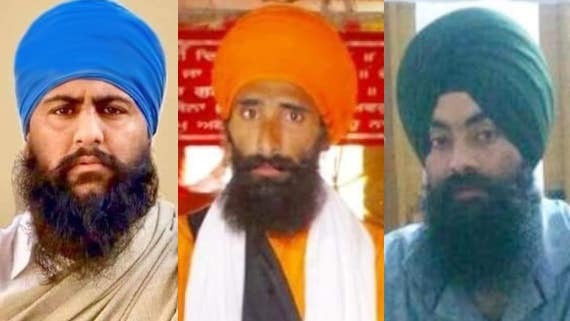 The court had dropped charges under section 10 and 13 of UAPA Act for the lack of proper sanction and convicted Arwinder Singh, Surjit Singh and Ranjit Singh under section 121 and 121A of IPC. The court sentenced trio to undergo imprisonment for life under section 121 (IPC) and pay fine of Rs. 1 Lakh each; and rigorous imprisonment of 10 years under section 121A and fine of Rs. 25,000/- each. This case was defended by a team of lawyers including Advocate H K Bhambi, Advocate Rajan Sareen, Advocate Sarabjit Singh Bains and Advocate H L Suman. Sikh Siyasat News (SSN) tried to contact Advocate Rajwinder Singh Bains and Advocate Sarabjit Singh Bains for their comments on this judgement but contact could not be established till the time of publishing this news. When asked to comment on the judgement of conviction in aforesaid case Advocate Jaspal Singh Manjhpur, who maintains the list of Sikh political prisoners, said that the court verdict had many judicial and legal flaws. He said that he was not connected with this case as a defense lawyer but added that he has studied the judgement which shows that the prosecution had failed to prove the charges beyond doubt but the court erroneously shifted the burden of proof on the arrested persons and convicted them despite the fact of prosecution failure to prove the case. He said that the court did not pay any heed to the fact that there were no recoveries of arms etc. and recovery of printed books and photographs were made basis of conviction. “On reading the judgment one finds that the judge had stepped into the shoes of the state to pronounce the charged persons as guilty; whereas judicial norms require a judge to keep himself at a reasonable distance to avoid state-prejudice against the charged persons”, said Advocate Jaspal Singh Manjhpur. “Over emphasis on ‘deterrent’ theory of punishment seems to have made the court to cross the judicial limits”, he commented adding that the flaws in the decision could form strong ground for its reversal in appeal.